I just came back from a lovely time in Napa, with delicious wine, a beautiful wedding, and fantastic food. Right outside of Napa is home to two of Thomas Keller’s most famous restaurants: French Laundry and Bouchon. While I would have loved to have visited both during my trip, reservations at both are like Christmas miracles. So I settled for the Bouchon Bakery in Yountville, right next door to the Bouchon restaurant. While of course everything was good, I have to be a slight critic and say that not everything that we got was as amazing as I had expected. However, there were two golden stars that I will never forget. The Strawberry Croissant and the Bacon Cheddar Scones. And so inspiration was born. I came home and immediately started checking to see how I could try to imitate these delicious treats on my own. 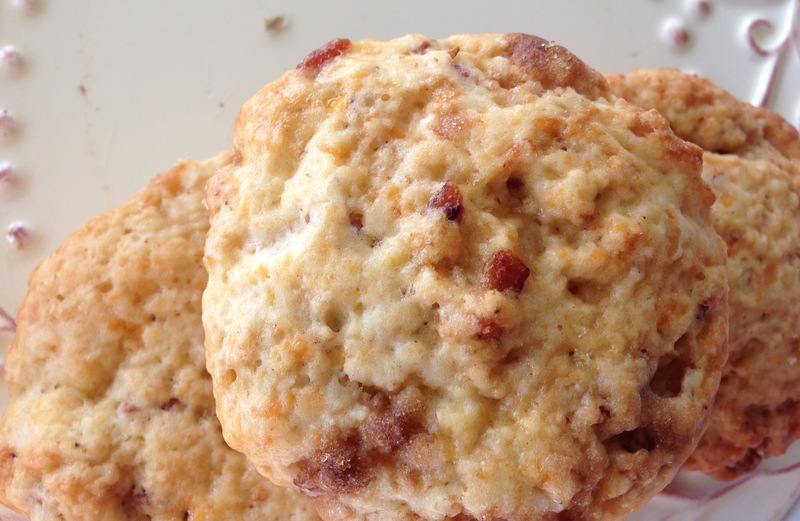 While of course they are no Thomas Keller bacon and cheddar scones, I did get calls just about how tasty they are.